Our family took a fun trip to Denver over the weekend. It ended up being a total splurge weekend since our hopes of a mini-vacation to the mountains never panned out. We had a super fun time. Splurging is always fun though, isn't it? We headed north Friday morning and stopped at Park Meadows mall. The kids have been saving their allowance money all summer and they each had a place in mind that they wanted to shop. Abbey spent her money at the American Girl store. We've been several times this summer and I love watching the little girls in that place trying to take it all in! Plus, I just love AG stuff and love that my girls still love playing with their dolls. Money well spent! Abbey bought some purple accessories that'll pop up in some pics later! After shopping for awhile, we stopped for lunch. John's parents took the kids to the Grand Lux Cafe when they were staying with our kids in May and the kids have been raving about it ever since. Of course that was where they all wanted to go when John asked them where we should have lunch! It sounds like the name of a casino to me, but it was yummy, and they get ten thumbs up for having Bendaroos for kids to play with while waiting! 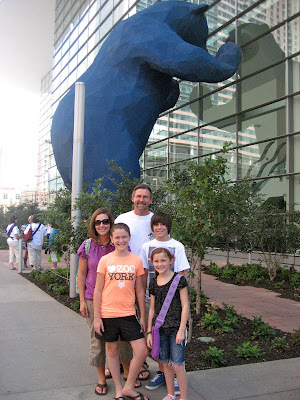 We did a little more shopping before heading downtown and checking into our hotel which was just two blocks from Denver's 16th Street mall and the Colorado Convention Center. Here's a view from our hotel room. See that big blue bear looking into the windows of the convention center? VERY fun. Downtown Denver has lots and lots of (very cool) public art. The bear sculpture is called "I See What You Mean" and if you're interested you can read more about it here. We knocked around 16th Street Mall for awhile before heading to the Rockies v. Cubs game. I love baseball. We had so much fun at this game!!! We were thankful the rain missed us. It was very windy and cool as the storm blew over but it cleared and turned out to be a perfect evening to play ball! We almost chose to go to the Saturday night game with some friends, but were SO glad we picked this game instead. The Rockies ROCKED the Cubs. They scored TWELVE runs in the bottom of the 8th. It was AMAZING. They were on a huge roll and the crowd was going NUTS. My kids know I'm a crazy football fan, but they were surprised that I got so worked up about baseball. We all sorta did. All the Cubs fans around us were so disgusted they left. 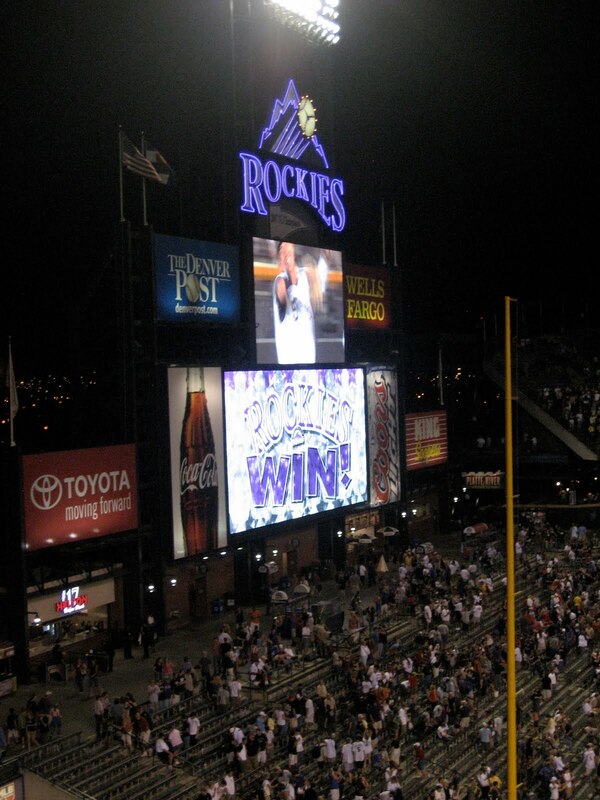 The Rockies won 17-2. We were walking back to our hotel after the game when John surprised us with a horse-drawn carriage ride! Huge splurge. So fun!!! The kids loved it. Thanks to hotel black-out curtains we all slept late Saturday morning which was wonderful after a late night at the game. One of the things on our list of hotel criteria was an outdoor pool. Do you have any idea how hard it is to find a hotel in downtown Denver with an outdoor pool? We never found one. And we vetoed several hotels that didn't even have an indoor one. We had the pool to ourselves that morning. The hot tub too. After swimming, we got dressed, checked out of our hotel and walked down to Lo-Do (lower downtown) for brunch at Snooze. John had breakfast there with his editorial team back in December and has been wanting to take us ever since. The wait was L-O-N-G but it was so worth it! I kinda regret not trying the sweet potato pancakes so I guess that just means we'll have to go back. Did I mention that we were by far the oldest people there? We were. It's a pretty hip joint! We walked around Lo-Do and the 16th Street mall for most of the afternoon. John hardly ever buys stuff for himself, but he found a shirt he liked at one of his favorite places in Denver--Rockmount. We stopped by pinkberry AGAIN. Oh my. I think I have a new addiction. Too bad (for me) that the closest one is an hour away. Original with blackberries and strawberries is my favorite, but I liked the pomegranate too. Here's a pic of the chocolate one just in case you chocolate lovers are feeling left out. Smile. We were only gone a day and a half but we had such a fun time. It was the perfect overnight getaway and a fabulous way to wrap up our fun summer! Did I just say that? I'm in a bit of denial that it's actually August. Didn't you heard me groan when I flipped my calendar over this morning. I'm going to put on some black clothes and sit in a pile of ashes. I'm soooooooooooooo sad that this amazing summer is almost over. Sigh. I should have detoured into Denver while I was out there. 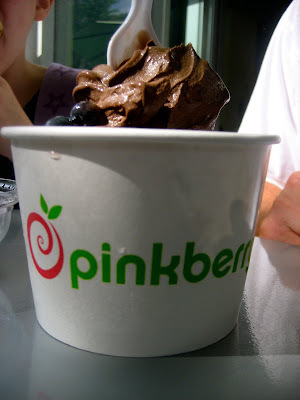 Pinkberry has been on my list. Sounds like a really fun trip!! Our major criteria for hotels is usually a pool. I LOVE it when we have the pool to ourselves - so much fun. What a perfect end to a perfect summer. Already looking forward to hearing about your next summer!!! :) Ha! Sounds like the perfect ending to summer vacation. Glad you guys had a good time. I'm so jealous you got to see that game in person! That would have been so cool! Of course, Cargo's cycle and walk-off home run would have been fun to see, too. 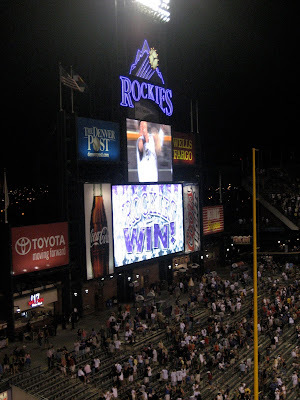 :) The Rockies had a good weekend - nice to see after that losing streak. What a nice weekend you had! Looks like the BEST time! I love vacations, and I don't know that the whirlwind weekends aren't the best. I know I've said this before but your family is beautiful. And I am TOTALLY commiserating with you on the end of summer. I'm feeling sad today, because it nearly over...I'll join you on the ash heap, if only for today. I'm so glad you have enjoyed this summer! I know you deserved it after last summer was so difficult. Yay for you 5! What a fun time!!! Must try pinkberry next time I'm up there! 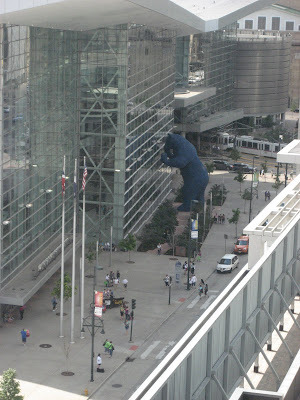 Is that the same part of downtown Denver that we stayed at when Kirk and I were there? All my cities run together...but I just remember Denver being FAB.U.LOUS. Loved it and felt so hip and cool there. And that trip looks like so much fun!! My kinda trip, for sure!!! That looks like a great trip, and exactly the kind of thing we would love! We used to go to Tulsa for weekends just to get away from Siloam Springs, and even though it wasn't quite as exciting as Denver, it was a real treat. We're in love with Cherry Berry! I ate at a Grand Lux in Dallas for my 30th birthday and all I remember are the beignets. Yum! 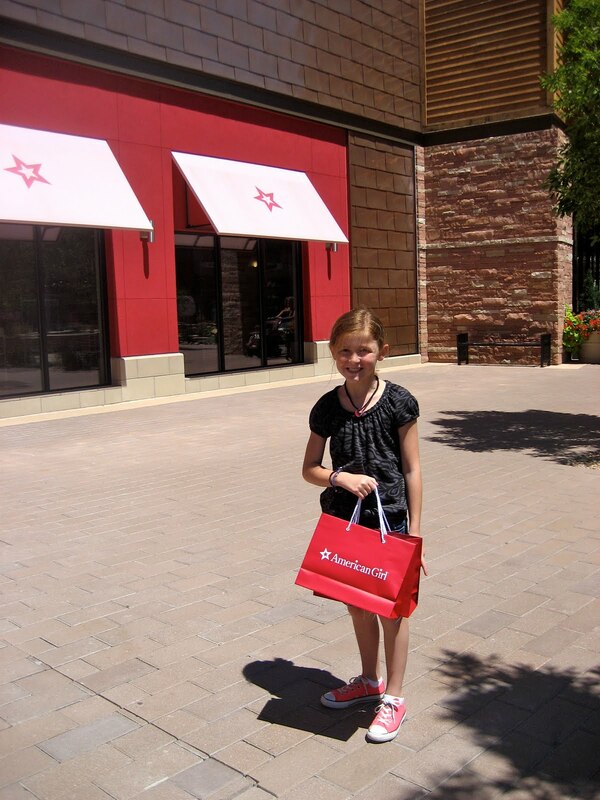 And American Girl stores are the best! Oh, and I'm with ya on the "calendar flipping" ... summer goes by way too fast! Further proof I think I need to be an honorary member of your family. SO FUN. What a fun little getaway. You packed it full. Cute family too. Like you, I hate to think that summer is nearing its end. 2 weeks from today = first day of school. i have one of those kids that likes to explore all her options too. man shopping with her is hard. glad ya'll had a great last minute trip. looks like a lot of fun. WOW!! Denver looks amazing! I would love to visit there one day. So glad you guys had an awesome time splurging!!! Loved all the pictures! Looks like such a fun trip! I go to Denver every few years...I'll have to check out some of these great finds next time I'm in town. I especially like the bear...and the Pinkberry DOES look delicious! It's only 7:55 AM right now, and I got in the mood for dessert reading your post! HA! We have a couple of yogurt places here that are much like Pinkberry. And. I. am. addicted. So glad your family had a fun weekend! Denver is the perfect place to do it! Thanks for the trip down memory lane for me. I noted to John that we were engaged on a carriage ride many moons ago. Also, a few years back, we visited Doug's parents for Thanksgiving, and stole away to the Marriott in DT Denver for our last night there. We splurged on a family carriage ride then, too. So magical. Crisp, near wintertime air, but pretty lights. Your investment in your family is going to pay huge dividends. Actually, it's easy to see that it already has. Aah, sounds like my kind of vacation. My husband would hate it.